Opened in 1996 with just a few tables and chairs, Lahore Tikka House is a renowned Halal restaurant in Toronto. The iconic eatery in Gerrard India Bazaar offers Pakistani and North Indian food, and serves as a core for the South Asian community in the city. 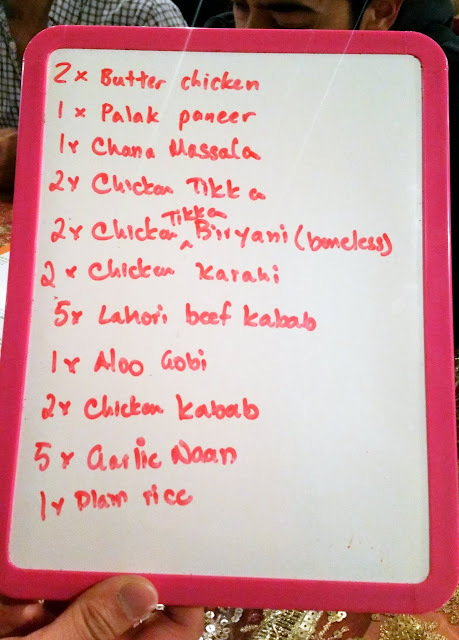 I haven't been to Lahore Tikka House (Facebook: Lahore Tikka House) in a really long time, at least not since I started my blog. What I remember about my last visit was that it was during the summer, and I was eating very delicious food with a group of friends. We were seated underneath a pitched tent in a parking lot, eating with plastic utensils and paper plates. I remembered having a lot of fun. Well, the tents and trailers are long gone now, replaced with this large, two-level stucco building. Talk about humble beginnings! Anyway, back to present time. It was a Saturday night around 7pm when we arrived at Lahore Tikka House and sure enough, the restaurant was completely full. Although it seemed quite busy the wait wasn't too bad; the eight of us were seated upstairs after about a half-hour. I didn't have a chance to check out the the first floor but the second floor is brightly decorated with a very ethnic touch. Once we were seated we were given a paper menu, and a small white board and marker to write our orders on. Lahore Tikka House offers a large number of Pakistani dishes. Lucky for me, I came with friends who know way more about the cuisine than I do so, naturally, I left the ordering to them. Once we were done, one of us got up to the counter to hand in our order. We got a number for the table in exchange. While we waited for our food, a server offered us roasted green chilies on a skewer. A few of us ordered mango shakes as well. 3) The food at Lahore is really not as good as before. It could be any one of those reasons or a mix of those reasons. I really can't say. All I know for sure is that the food that night didn't blow my mind like how it once did. Two things about the dinner stuck out. First, the Butter Chicken tasted a bit sour and was less creamy and buttery than what I'm used to. Second, a lot of dishes were very oily, such as the Palak Paneer, Butter Chicken and Chana Masala. Those two things aside, I still thoroughly enjoyed Lahore Tikka House. I would recommend the famed restaurant to anyone because both the decor and ambiance there are unlike anything you'll likely experience at any other restaurant in Toronto. 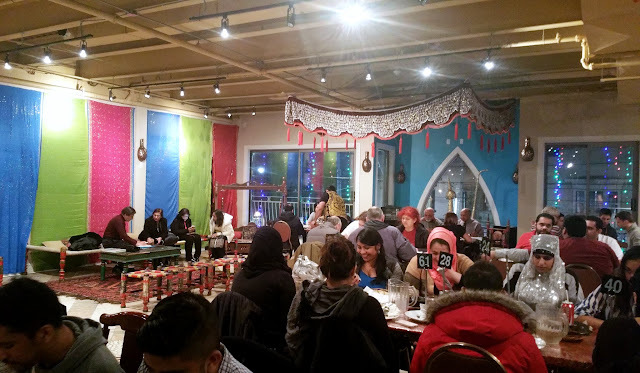 Lahore Tikka House is an oldie but a goodie, and it's a place where Torontonians of all backgrounds can enjoy Pakistani cuisine and culture.